Breakfast time is always such a dilemma. Not just because when I first wake up I usually have no idea what time it is and where/who I am. 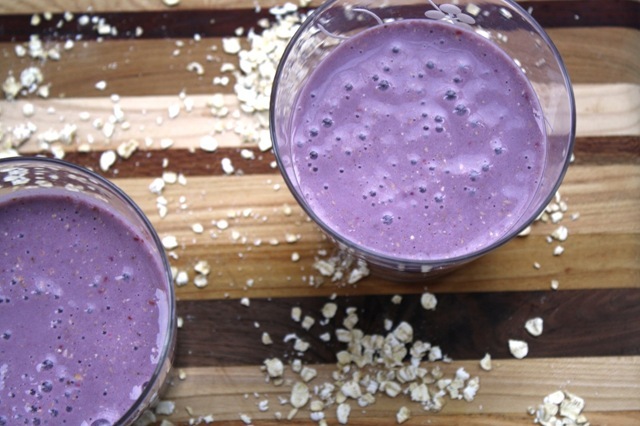 Smoothies are delicious and make me feel healthy and virtuous to start the day – but there is nothing quite so cozy and satisfying as a bowl of oatmeal, especially with a giant spoon of peanut butter melting over top. In the winter steamy oatmeal almost always wins, especially when it is, like today, 20 degrees and heavy with snow outside. But luckily today there was no decision to be made, for the best of both has been combined into one yummy AM treat! And I’m not talking about tossing some raw oatmeal into a blender, because what’s so cozy about that? Toasting the oatmeal beforehand fills the whole kitchen with a delightful aroma and makes the smoothie taste nice and toasty warm, even if you need to wear mittens in order to hold your frozen glass :). Preheat your oven to 350 F. Sprinkle the oats onto a baking sheet and toast for 10 minutes until fragrant and lightly brown. Pour oats, soy milk, banana and raspberries into the blender and combine. 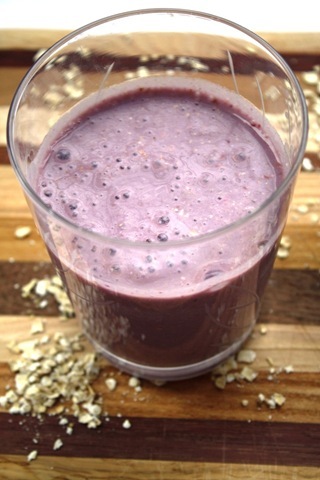 Makes one big glass or two small smoothies to share, if you’re feeling especially generous :).